Choose from a few options to find the perfect match for you and your family/friends. Enjoy an intimate sail aboard the 41' Tartan sailboat during the day or for a romantic Outer Banks sunset. Or travel with a larger group from Duck across the Currituck Sound on the Sanctuary Vineyard Voyage. Spots fill up fast book your cruise today! We have affordable options for the whole family and intimate cruises available for a special occasion. Sail the Albemarle sound aboard the 41 foot ketch Movin' On. Whether you come alone, as a couple or as a group your experience on this sailing adventure is warm, friendly and personal. During the trip we often see dolphins, turtles, pelicans and other wildlife. If you have some of your favorite music on your i-pod or MP3 player, bring it along and we'll play it on our on board stereo system. Sailing into the sunset isn't just a dream with the Movin' On. Travel out to the Roanoke and Albemarle sounds then sail back as the sun is setting. Soft drinks, cheese, crackers, fruits, and cookies are included. You may bring your own beer or wine (no bottled beer, cans only). Take a private trip across the Currituck Sound to Sanctuary Vineyards in Jarvisburg, NC from our Duck Kitty Hawk Kites Store. Your cruise will lead you through the beautiful canals and historic hunting area of Dews Island just off the Currituck County mainland. You'll be personally escorted to Sanctuary Vineyards straight from the dock to taste and sample the fine locally grown and bottled NC wine. This cruise is not appropriate for Children under 5 years old. There also isn't a bathroom on board the vessel so please use please be sure to plan accordingly. Depart the dock for an unforgettable cruise down Currituck Sound to appreciate an East Coast premiere sunset destination. Escape the crowds to admire the serenity of an Outer Banks sunset. Passengers will enjoy a panoramic view of the Sound as the sun sets in the distance. Each sunset is unique as the light reflects on the clouds over the water. Small soft-sided coolers or totes are welcome (for safety, please no glass). The Backwater is a newly commissioned vessel built to travel safely in the open waters of North Carolina's sounds and estuaries. 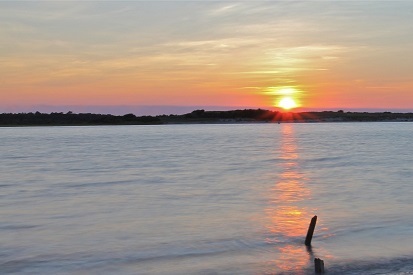 Take a private trip around the Currituck Sound for an unforgettable cruise at an East Coast premiere sunset destination. Escape the crowds to admire the serenity of an Outer Banks sunset. Passengers will enjoy a panoramic view of the Sound as the sun sets in the distance. Each sunset is unique as the light reflects on the clouds over the water. Small soft-sided coolers or totes are welcome (for safety, please no glass).